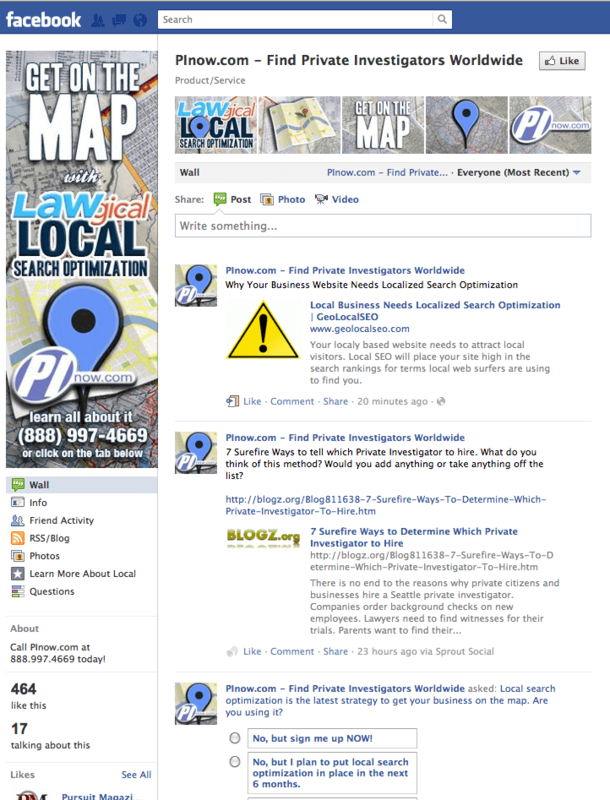 We have a busy month planned for private investigators who are fans of the Offical PInow Facebook Fanpage. We’re devoting the entire month of February to sharing information and getting opinions from the professionals who know the industry best: You! We’ll be hosting a variety of activities including questions, polls, articles, news and some Q&A sessions. If you’re not already a fan of the PInow Facebook Fanpage, make sure you like us to get involved in the conversation. Top Private Investigator Bloggers: Check out our list of Top Private Investigator Bloggers and let us know which list-makers you will follow and what posts you found most interesting. Infidelity Investigations: We’ll be asking for input on infidelity investigations, including advice for handling unfortunate situations, professional tips and crazy stories. Stay tuned, because later in the month we’ll be releasing some surprising information and statistics about infidelity investigations. Local Search Optimization: Get ready to discuss Local Search Optimization and how it can get you more business. If you don’t understand what local search is and why you need it, or if you have a general marketing question, post it to the page. Client Concierge Dom Delisle will be on-hand to answer every question, even if it’s only specific to your company. We’ve already posted some informative articles and video, so check them out to learn more. We’ll be posting questions of the day, polls, news and interesting information throughout the month, so keep checking in to share your opinion and find out what your colleagues have to say. Industry news: The PInow staff closely monitors various news channels and posts the most relevant and interesting pieces to the page. Some of our favorite topics include legislation changes, high profile cases, tips from investigators and profiles on firms that focus on niche markets like elderly abuse. Informative articles: Informative content is sourced from the PInow Investigator Center and other websites. These articles generally focus on marketing, efficiency and safety tips. They also provide tips for setting business goals, hiring and utilizing free business tools. Questions of the day: To get input from industry professionals, we often ask questions. Questions are usually about recent news, upcoming events, technology and on the job experience. Investigator professionals: The PInow Facebook page interacts with over 460 fans who like and share posts, offer their opinions and share their industry tips and experiences. If you’re a new fan, feel free to introduce yourself to the community. Previews and call-outs: We’ll call it the insider scoop, because we usually preview new projects, technology and studies with our Facebook fans. Whether we’re compiling a list of top investigators on Twitter or releasing an infographic we always make sure our fans are some of the first people we tell. Facebook is a great place to connect with your peers and receive the most up-to-date industry information. It’s also a great place to offer feedback, so if there’s an article you’d like to see in the PI News Roundup or an activity you enjoyed, let us know. This month is going to be filled with information and fun, so make sure you like the Official PInow Facebook Fanpage to participate.